Boil 380ml water and add in vermicelli cook for 3-5 min. Add in Chilli Paste and creamer, and then stir well. Additional vegetables, herbs and ingredients can be used according to your preference. Instant Heritage Curry Vermicelli is ready to be served. Keep in cool & dry place. 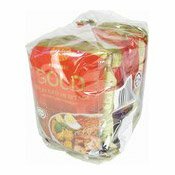 Ingredients: Rice (38%), Curry Paste (Spices [40%], Chillies [16.6%], Cooking Oil [12%], Sugar [11%], Onion [8%], Garlic [6%], Salt [6%], MSG [0.14%]) (35%), Sago Starch (10%), Corn Starch (10%), Non Dairy Creamer (7%). Simply enter your details below and we will send you an e-mail when “Gold Bihun Kari Keritage Instant Curry Vermicelli (咖哩米粉)” is back in stock!